Singapore’s incumbent PAP (People’s Action Party) won the 2011 General Election. It was the 16th General Election in Singapore and the 11th since independence. The governing People’s Action Party (PAP) secured their 13th consecutive term in office since 1959. PAP won all but six seats to the opposition party (Workers’ Party). People’s Action’s Party (PAP) retained power after one of the most fiercely fought election battles in the nation’s post-independence history. 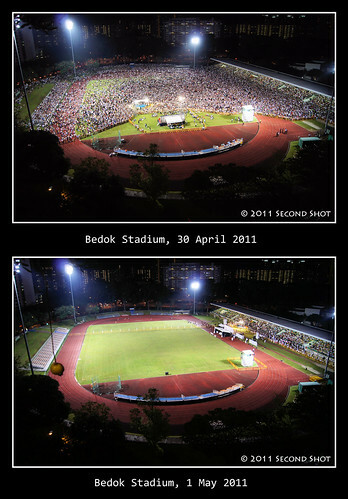 Photo taken of two political rallies on different day but same location and time of the night. Top opposition (WP) party and bottom incumbent (PAP) party. Tags: General Election, LKY, PAP, PM.